"Pride in the Past; Commitment to the Future" aptly captures the spirit of NJBTEA's professional leadership throughout its existence of over 100 years. 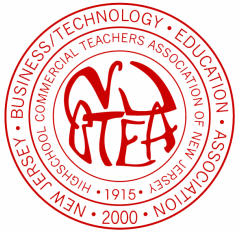 NJBTEA was founded as the High School Commercial Teachers Association of New Jersey on October 23, 1915 by a group of dedicated business educators at Central High School, Newark, New Jersey. Its goals in the early years were to foster curriculum improvement, promote the need for teacher certification requirements, and upgrade the status of business education. In the next 20 years, many of the organization's original goals were achieved. Most importantly: State certification requirements were established for business educators, and a baccalaureate degree and work experience became requirements for this certification. The first issue of the Business Education Observer was published in 1931 as a tool by which to disseminate trends as well as the results of research in the field. During the forties, state business education associations were being formed all over the country--many of them inspired by the work of the New Jersey group. In 1946, the name of the organization was changed to the "New Jersey Business Education Association" to better reflect the objectives and terminology of the time. The association's activities expanded significantly as well. The mission of the New Jersey Business/Technology Education Association is to serve as the advocate of business/technology education within the state and provide opportunities for professional growth leading to quality business/technology education programs. Advocate the development of quality business/technology education programs at all levels of education. Sponsor a spirit of fellowship among all members. appreciation for and about business and technology. Investigate, research, and disseminate information leading to the advancement of business/technology education. Reinforce the exchange of ideas and cooperative interaction among all individuals and groups in business/technology education while fostering an appreciation for diversity. Encourage and provide opportunities for professional growth in business/technology education. NJBTEA plays a vital and dynamic role in promoting high standards in the teaching of business education in elementary schools, middle schools, comprehensive high schools, county vocational-technical schools, community colleges, independent business schools, and colleges and universities in New Jersey. As NJBTEA accepts the challenges of the 21st century, the association and its members continue their "Commitment to Excellence" in providing quality business/technology education programs.